I realized yesterday marked a decade of having my husband as a Valentine! Although our relationship has changed over the last ten years, we first started out being Sophomore’s in High School, sharing our very first kiss on the same day. And here we are about to celebrate our first year of marriage (Feb 26th)!It’s been a sweet decade and I love the history of “us”. Other than my cake pops (thank you all for kind comments! ), here’s a couple pictures of how I made it festive! Pink is a must! This top is from Forever 21. Sparkley gold shoes from Payless. 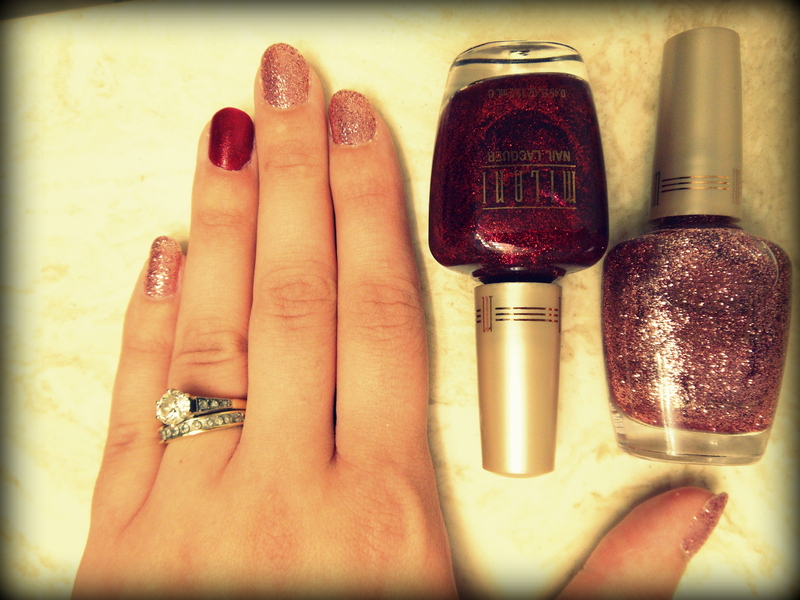 Weeks before V-day, I found these nail polishes by Milani (found at any drug store) in Disco Lights and Ruby Jewels. By painting my ring fingers, it was a great way to incorporate both gorgeous colors!